Play a fun, simple wall-building icebreaker, e.g. Prepare blocks/Uno stacko. Kids take turns to run forward and place a brick, then run back, and next person goes. Key is to build highest wall. What was his job? Cupbearer to the King. After Nehemiah heard the news about the broken walls and burnt gates of Jerusalem, he prayed and asked God for favour from the king. One day, Nehemiah was doing his job as cupbearer with the king and queen. He took the wine and passed it to King Artaxerxes (can get kids to repeat name). Normally, whenever you are in front of a king, no matter how you feel, you have to look happy. You cannot be long-faced, or the king might get angry with you. But that day, Nehemiah was so troubled by the broken walls in Jerusalem that he could not hide it from his expression. Wow! What favour. 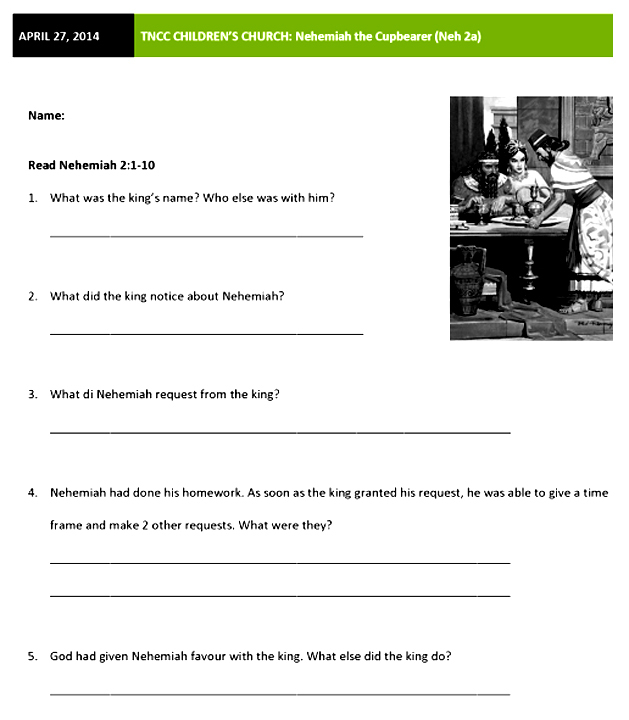 Not only was the king not angry with Nehemiah, but he asked him what he wanted. 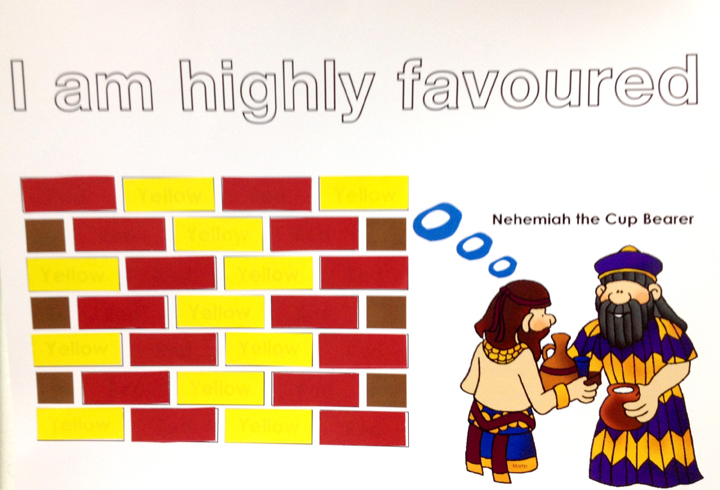 Before he answered, Nehemiah quickly prayed to God. It’s good to pray and ask God for guidance and wisdom in all things, so that we don’t answer rashly or do things without thinking. Then Nehemiah asked the king to send him back to Judah so that he can rebuild the walls. Nehemiah had asked God for favour, and he had also done his homework in preparation for the trip. He was able to give the king a time frame. Because the “good hand” (favour) of God was on him, the king granted all his requests. The king also sent army captains and horsemen to accompany Nehemiah back to Jerusalem! Nehemiah could not have done the huge task that’s ahead of him without the blessings and favour of the king. The one thing he asked God for was for favour with the king, and the king not only granted him what he asked, but over and above. Jesus made us righteous, so God’s favour is upon us all the time! Nehemiah left his high-ranking position in the king’s courts to serve his people by overseeing the rebuilding of the wall. Jesus gave up His position in heaven to come to earth as a man and die for us and to rebuild our broken lives.